Dragonflies fascinate us young and old. This gossamer flyer will touch the heart of your recipient, and the delicate, wing-like petals raining gently down in the background will let them know you care. Petals Dragonfly scatters quiet beauty for any occasion: Valentine’s Day, Birthday, Congratulations, Thank You, Mother’s Day, Miss You, Sympathy or Just Because. 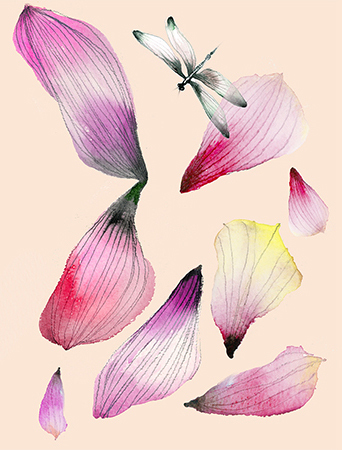 Petals Dragonfly watercolor greeting card features lush original art front and back, offset printing with soy inks, recycled heavy card stock and infinite send-ability.